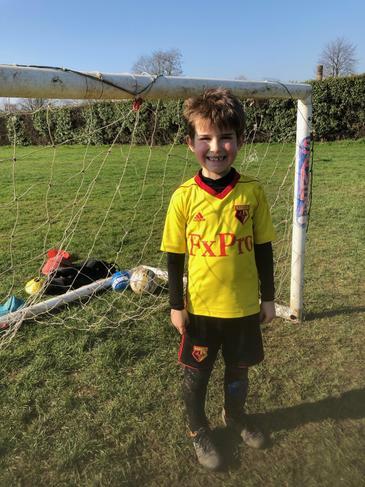 We love sport at Fielding and work very hard to provide children with lots of opportunity to take part in as much as possible. We have our constellation tournaments which the whole school takes part in, our lunchtime challenges which the whole school has the opportunity to take part in and we have our sports teams who represent Fielding in competition. 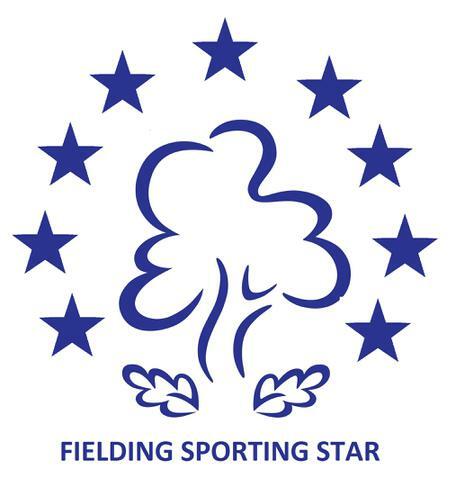 BUT... we know so many of our children play sport and enter competitions outside of school and we want to celebrate that too, so this year we are introducing Fielding Sporting Stars. 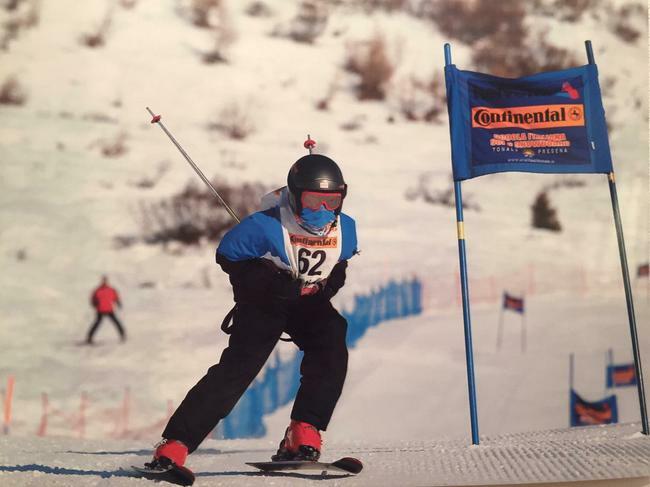 1: Take part in any sporting competition or event outside of school. 2: Make sure you get some photos! These can be of you taking part during an event, at the start or end of competition or holding up any trophies or medals etc. 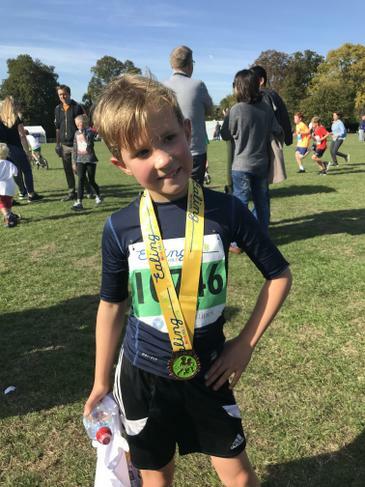 4: Send the report and any photos you would like published on the school website to dthomas88.307@lgflmail.org, with the subject heading 'Fielding Sporting Star'. 5: Wait for it to be published. Its that easy! 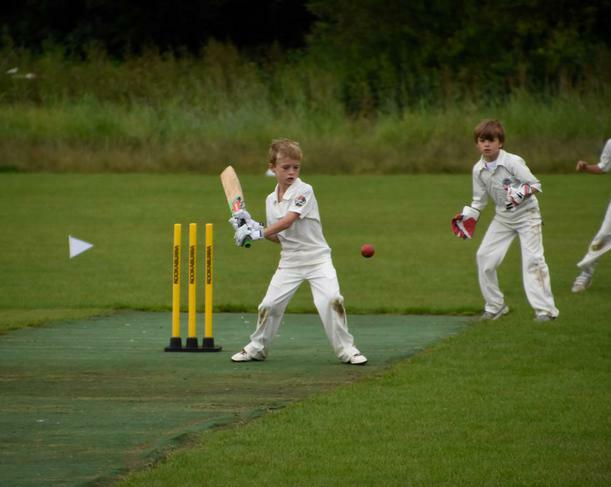 So who will be the very first Fielding Sporting Star? Get competing, get snapping and get writing! I performed in the 'Stars of Tomorrow' dance competition. I won first place for my tap solo. 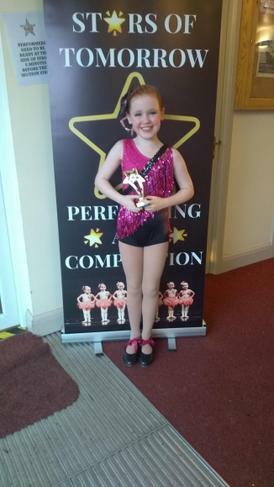 I also came second for my modern solo and third for my song and dance solo. I love to dance. 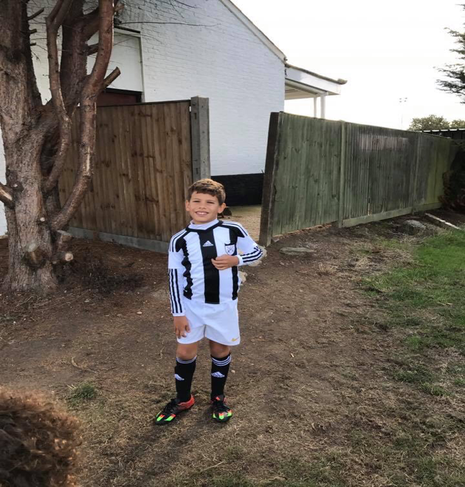 Here is Aiden in 2F at the end of his 2 hour football training at Blondin Park every Saturday. Aiden enjoys football and gets to train with other Fielding children at this session. 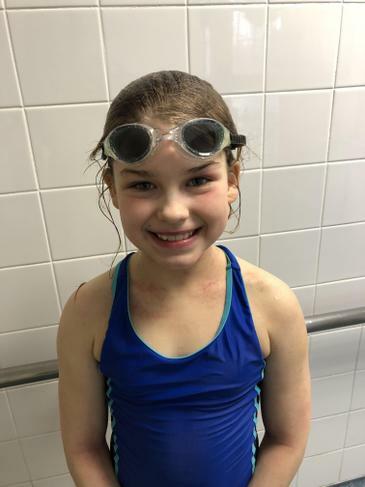 Here is a photo of Lyla in 4P at her stage 6 swimming lesson. 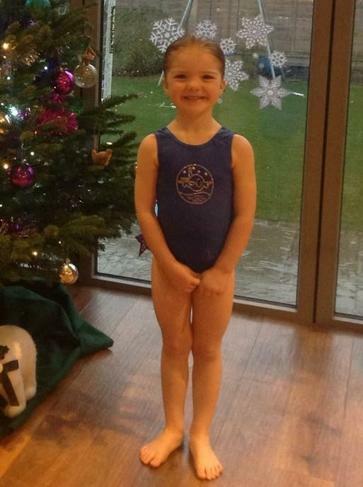 Over half term Lyla had a race with her Grandad in the pool, he beat her by 1 second, but he is a good swimmer! 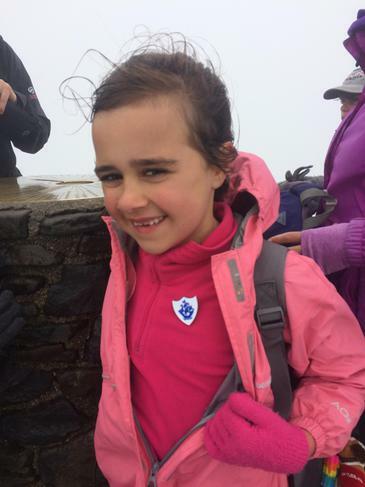 Here is Bella looking very proud of herself having passed her first level at skiing school over half term. 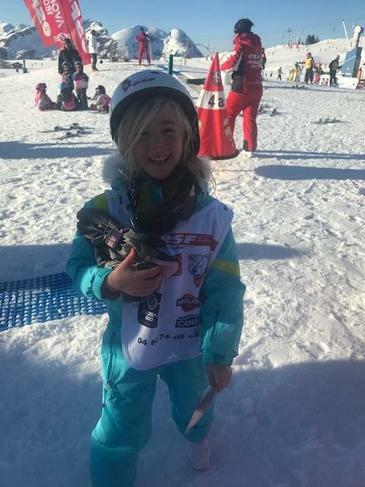 This was Bella’s first ever time skiing so she did really well to pass and she was fearless and confident coming down the slopes with great speed and balance. 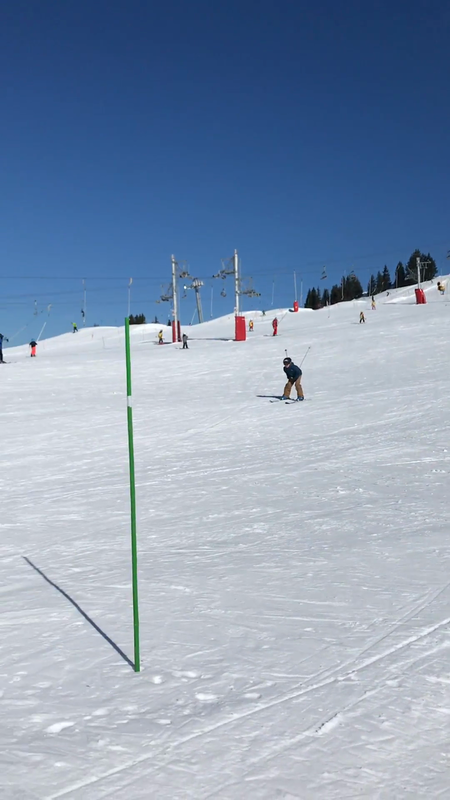 This half term I went skiing for the first time to Avoriaz which is in the French Alps. I loved skiing and by the end of the week I managed to pass the ‘Flocon’ level and earn my snowflake badge. Here is a video of me coming down a green run super fast. The hardest run I completed was a red run which was really steep. 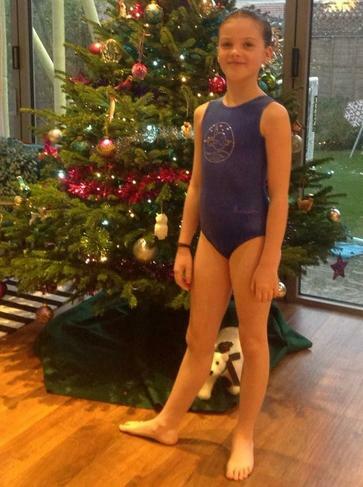 I recently took part in my gymnastics club's Christmas shows. 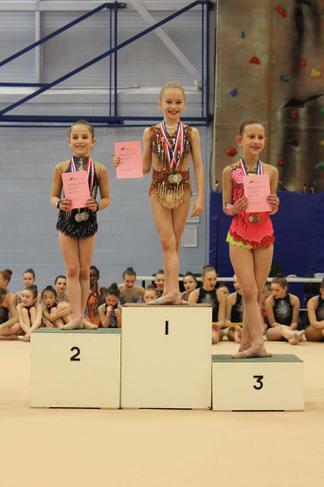 I performed my routine twice and really enjoyed the atmosphere. I'm proud of how much I've progressed since last year's shows. I've been doing gymnastics for just under a year and I'm at Intermediate level. I took part in my club's Christmas shows last week and really enjoyed showing my family all that I've learned so far. I performed in two shows at my gymnastics club's Christmas extravaganza. I loved the routine and music (Rockin' Around the Christmas Tree) and waving to my family in the audience. I've also recently passed my level 9 in gymnastics skills. 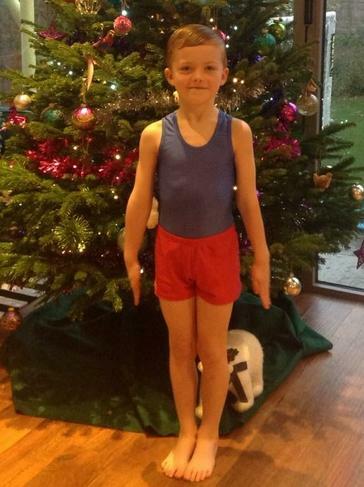 I took part to the Christmas shows at Heathrow Gymnastics and Joyce Butler school of Dance and had a lot of fun. Though the Heathrow gymnastics display was my absolute favourite and gave me loads of butterflies! My family is very proud. My ‘nonni’ from Italy came to watch me too so this was very special! 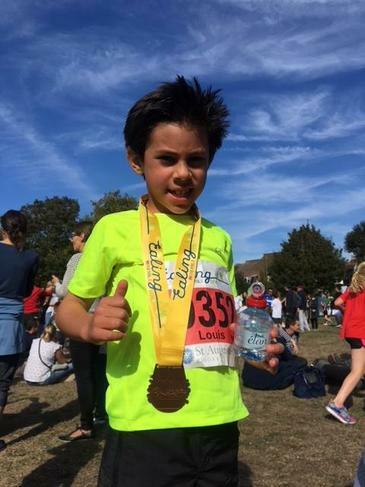 On 29th Sept I ran in the Ealing mini mile for the first time. I really enjoyed it and was pleased with my time of 7mins 57 secs. 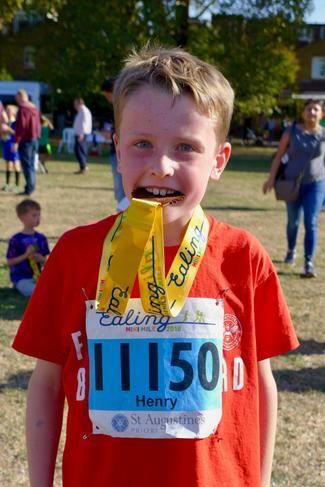 On Saturday, 29th September, I run the Ealing Mini Mile. This was my third time running it. I really enjoy taking part of the Mini Mile as this is such a fun event. I also like to challenge myself. I wanted to beat my time from last year so I made sure I was in a good position at the start line and stayed focused. I'm very proud to say that I did it! I finished in 4th place with a time of 6 minutes and 49 seconds! I was feeling tired by the end but gave my best and it was worth it. I'm very happy! 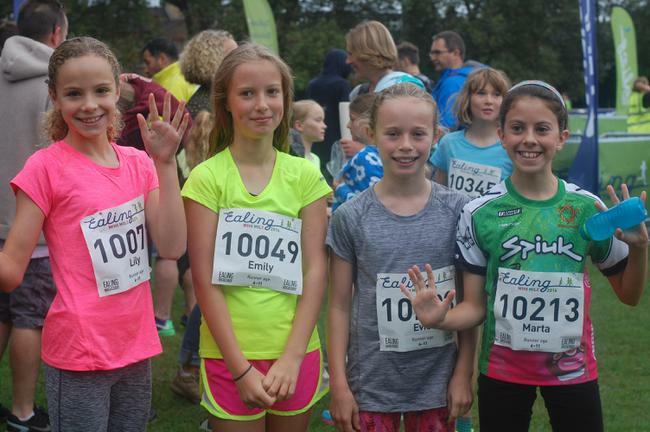 On Saturday 29 September, we took part in the Ealing mini mile. It was the first time we had done this or anything like it and we are so proud that we did it and finished. We both ran the mile in about 12 and a half minutes. Ishaan says "I ran really fast and Daddy couldn't keep up with me!" 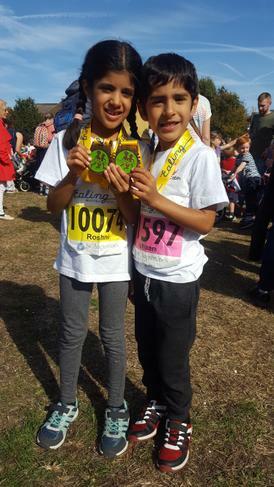 Roshni says "I ran on my own and I was so excited. I am really proud of myself! 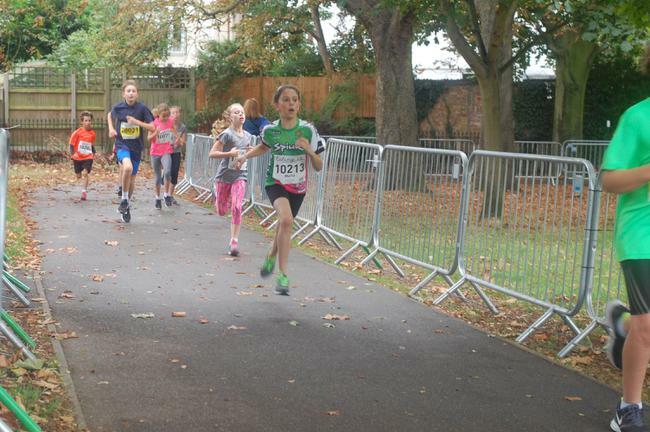 On Saturday 29 September I ran the Ealing Mile. A lot of people went to the front line at the start as they want to get a better time and I was one of them! My time was 9 minutes 48 seconds and that was my best time yet. At the start I felt like I wanted to do my best and beat my PB. The hardest bit was the last bit where there was a hill and I was tired. I felt very proud when I got my medal and ran to my parents, and I was very happy. 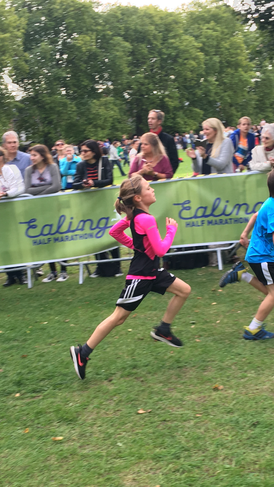 On Saturday 29 September I ran the Ealing Mile and got my best time yet. When I found out I had got 6 minutes 50 seconds I was very proud of myself and for the training I did to achieve it. 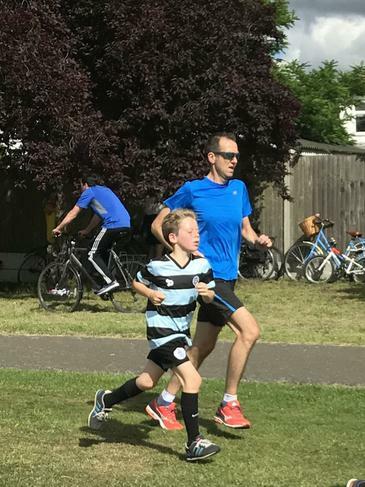 During the race I had many strategies, like running on the side of the path so I could overtake people more easily, and all I thought was ‘keep running’. 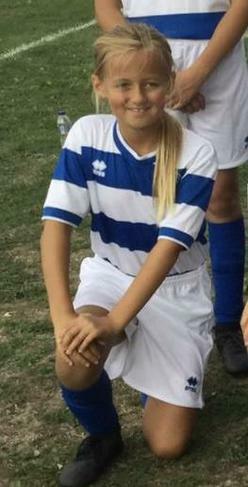 Over the summer holidays I was selected to join QPR U12 girls football team along with my friend Lily. We won our first league match 4-2 last week and I scored a goal and did an assist. Last season I trained with Chelsea U12 girls and in a big tournament against lots of other clubs and I was the top goal scorer. I was also the only girl in Ealing selected to play for the District team with 13 boys! This year I’m so excited to be captain of the girls school football team and looking forward to a great season ahead! 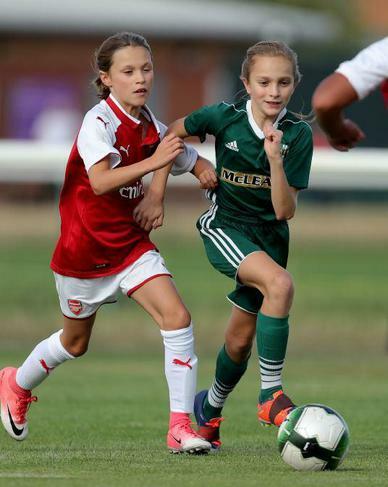 During the summer holidays, I was selected to play in the Arsenal girls U11's squad against a visiting US team. This was my first international fixture so I could not wait to play! The game was tough and we ended up losing to a fantastic visiting team but I scored twice and provided two assists. I was also awarded Goal of the Match by the Arsenal coaches. I've been asked to play in another international match for Arsenal against a visiting Polish team end of September so I'm looking forward to that too! 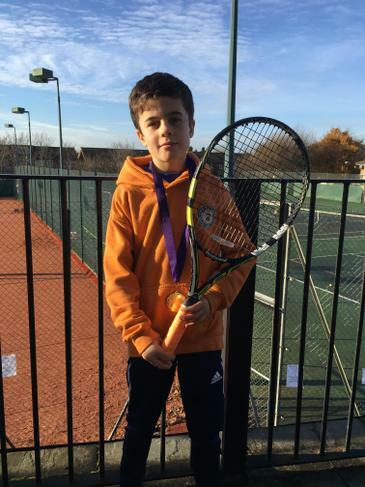 Across the spring and summer, I took part in a series of LTA county tournaments called the Babolat Mini Masters and won enough points to be amongst the eight girls and nine boys who qualified for the Finals at Paddington Recreation Grounds on Sunday 15th July. The day of the Finals was blazing hot and I had to play and beat each of the girls, but after some pretty tough matches - a string of wins meant that I was ultimately named Girls Champion 2018! I had opportunity to be part of the biggest Tigers Challenge festival in 2018 with 215 teams from all over UK. 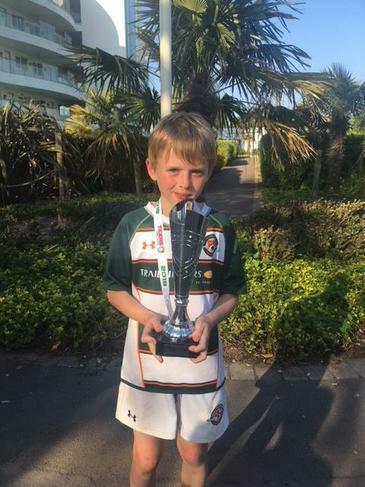 I was playing for Ealings Trailfinders Rugby Club U10. It was a tough three days of competing against other UK teams .There were many trys scored throughout the tournament by many players, but the main key to success was team play. We took 3rd place. After the tournament we headed off to the venue for the award presentation. This year the awards were presented by Leicester Tiger Lock, Mike Williams, Neil Black and Freddie Tuilagi. It was very nice to be on a stage with my team to receive the trophy and medal. I love rhythmic gymnastic a lot ,its my favorite sport. 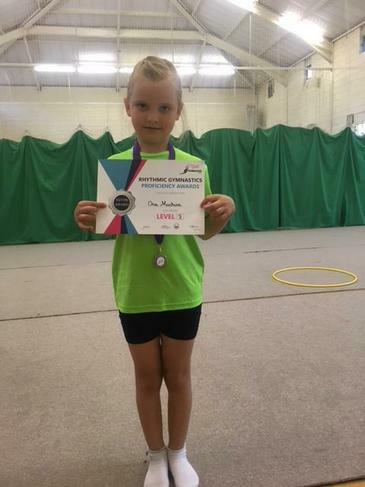 On 16th of July I have been accessed to check my progress at Ennis Gymnastic Academy . I had to show my rhythmic gymnastic skills ,dance and choreography routine . I've been amazed to receive Level 3 Award. 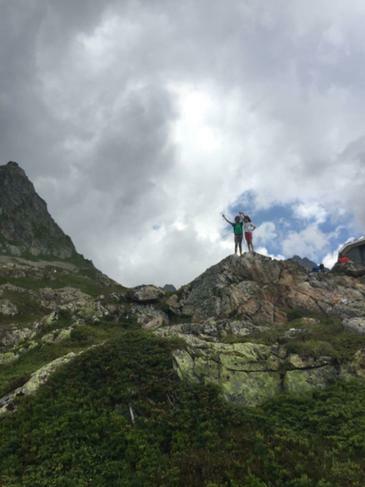 Alya and Eve climbed up to a refuge at 2,148 meters in the Swiss Alps this Summer. On Sunday 19th August I played cricket at the Lords Nursery Ground in the final of the Gubby Allen cup competition. 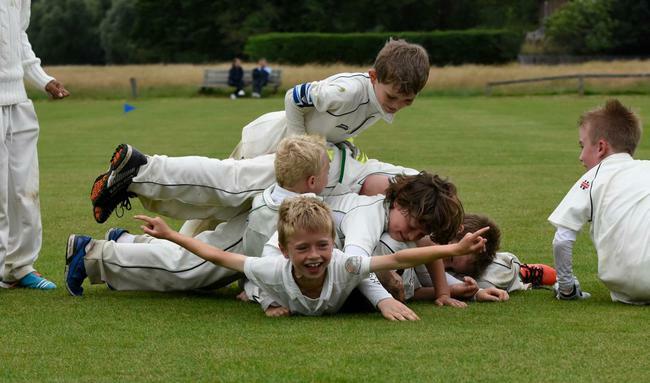 This is the competition for every U10 team in Middlesex. About a month before, Ealing CC (my team) competed in a semi finals day against Harrow CC, Hampstead CC, Holtwhites Trinibis CC and Richmond CC. Richmond CC and Ealing CC won all their first 3 games so it went down to a decider which we won quite comfortably. This meant we were on are way to Lords the home of cricket. It was a long wait but the day finally came. As the captain I got to do the toss, which we won and I chose to bat. It was twenty over pairs format and we scored 102 despite one of our best batsman getting out on the first ball of the game. So Primrose Hill CC needed 103 to win for what looked like a good game. We bowled very well and fielded very well by getting all five of our wickets from run outs, most notably Nathan’s run out with a direct hit from very far out with just a couple of overs left. So they needed 13 off the last over. The first five balls went for 8 runs and that meant Primrose Hill needed a four of the last ball to tie or a six to win. It was a very good ball and we got a run out. This was the first time Ealing had won the competition in 19 years. We had a fantastic season at TopBins five a side. We started in September as one team and grew into two teams. We had two strong girls in the team, Zoe and Ellie who were amazing at defending. We have played against strong teams and committed through cold weather, snow and heat. We didn’t win the first position, but had Aram who made us proud by winning the top scorer trophy with 49 goals! We are proud of our results and to have demonstrated strong sportsmanship. 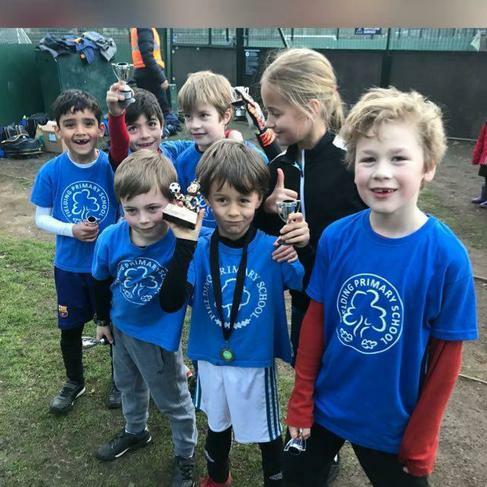 We formed a football team called Fielding Foxes and we have been playing 5-a-side football matches every Friday after school in Lammas Park. 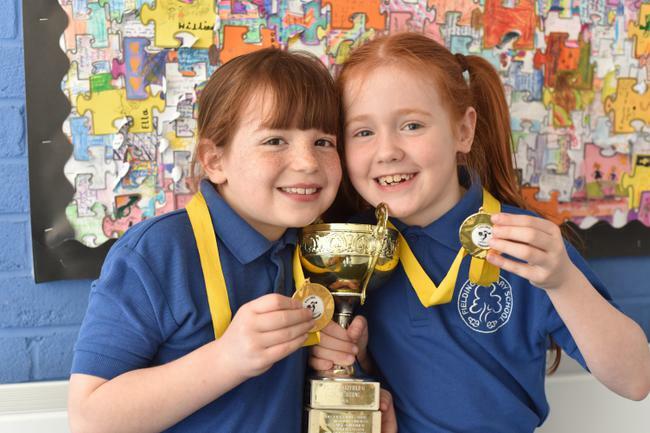 We have really enjoyed our games and have been the winners of our league every term. 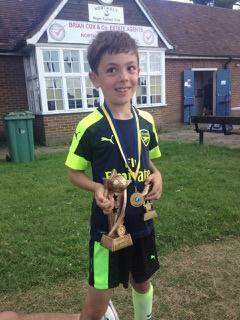 James also won the top scorer trophy. Chris, our main coach, and Issy, assistant coach, have been amazing and given us lots of encouragement. We are all very excited for the next season! 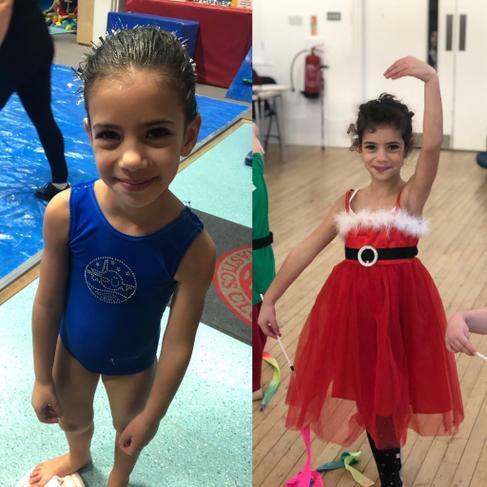 On Sunday 1st July Miss Reena's Grade 1 students all took their ballet exam at the Royal Academy of Dance in Battersea. These students are all from Year 3 & 4 and went in groups of three or four at a time, most have done ballet at Fielding since Enpoint first started running lessons but this is their last term as Fielding cannot offer Grade 2 onsite. 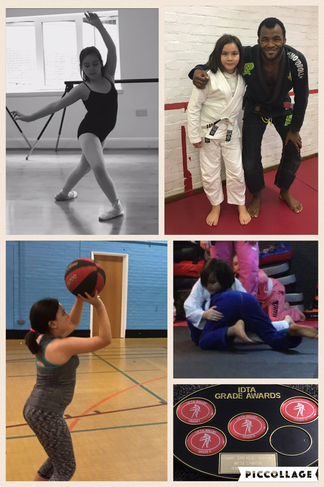 All the girls have done extra lessons on Sundays to prepare for the exam so their commitment has been great. 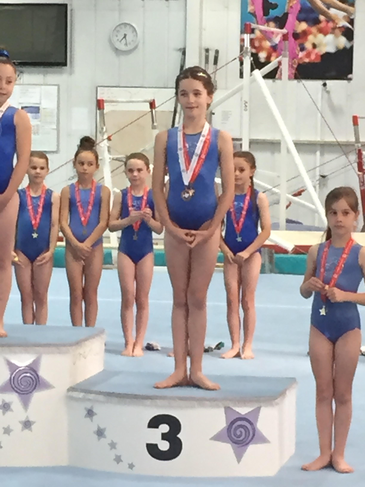 Chloe, 3S says: "I was a bit nervous and excited but being with my friends was fun and I was proud to do my best"
I went to my Club Championships at Heathrow Gymnastics Club on Monday. I'm in the Advanced class and we had to compete in Bars, Beam, Floor, Vault and also present an individual tumbling skill (I did a round off back handspring). When we had done all of that, the judges added up all of our scores. Then we had the medal ceremony and I got third place! I feel really pleased and proud of what I've achieved. I really love tennis and have been taking lessons at Ealing Lawn Tennis Club since I was 5. I now play at least three times a week and hope to try out for the Middlesex Youth Squad next year. In the meantime, I’ve started playing in a few tournaments, most recently the Babolat Mini Masters. Last weekend at the Carlisle Park competition I was very proud to be voted ‘Best Girl’ by the event organisers; receiving a certificate and prize. I’m really looking forward to the summer where I get to go to ‘Sports Camp’ and play tennis every day! I was awarded the trophy for the most improved player in my team at Hanwell Town. The coach chose to give me this award because I have been playing in a new position and delivered my best in the whole season. My passion for football continues! Jude took part in his first golf tournament on Sunday and did really well. He has been playing golf for approximately 6 months, takes part in group lessons every Sunday and is a member at West Midd Golf Club. He is doing really really well just like his brother Charlie. His tournament took part over 3 holes of the golf course and he came 2nd overall. 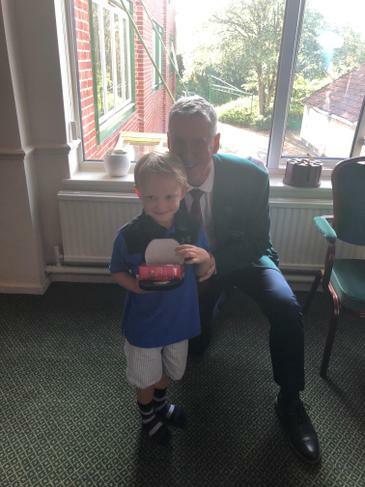 During a presentation, he received a medal, a pack of golf balls and a certificate and is very pleased with himself. I played in an all day girls Football Festival during half term for the U12's QPR Manager. We beat seven other teams to finish top of our group and gain a place in the knock out stages. We played so well as a team and ended up winning the final! We didn't lose one game or concede a goal all day which was a great achievement. I also loved playing alongside my Fielding girls football team mate and friend Izzy. I also played in a six aside tournament for Arsenal Women FC but unfortunately we got knocked out in the quarter finals. We played a lot of very tough matches but it was a great day and I was very proud to represent Arsenal. I already can't wait for the new season of girls football at Fielding although I'll be so sad to see so many of my Y6 team mates and friends leave the team. 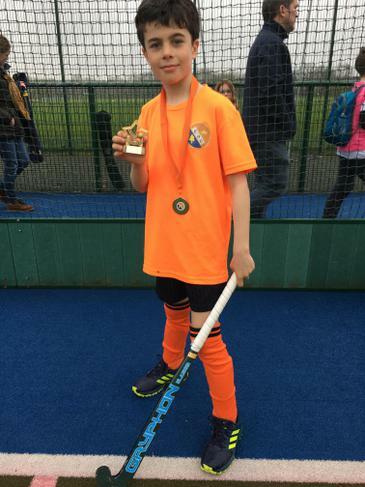 I play hockey for Ealing Hockey Club. We train on Sundays and often have matches against other clubs. 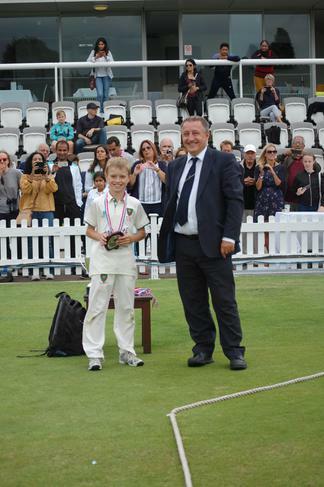 Last month, I was very pleased to be named ‘u10 Player of the Year’ for which I was given a trophy. I play as a forward on the left wing, and have managed to score and set up a few goals this season. At the end of the season I was selected to play in a tournament against the best clubs in Middlesex. We just missed out on getting to the Semi Finals but we still did well as we’ve only been playing together as team for about a year. Me and Lucy won a cup from Ealing Dance Festival at St. Benedict's School. We won the cup for our dance which was a modern duet but the bad news was that we had to share it with another dance school. We have been practising our dance for almost a year. Afterwards we felt very proud of ourselves as there were 10 schools in our section and we were chosen ahead of all of them. Next time we want to improve our dance by improving eye contact and spicing things up a bit with some more dance steps! 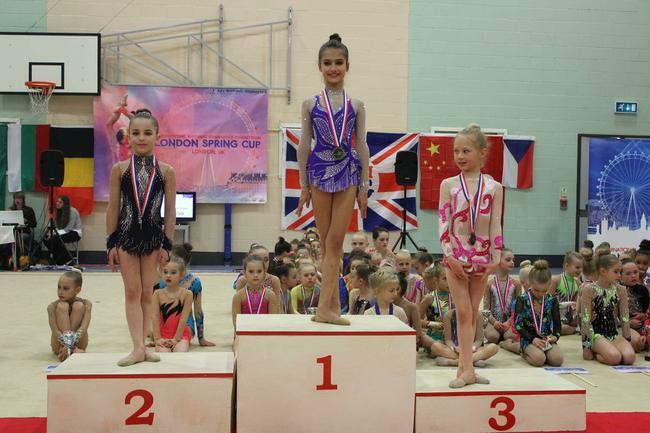 On Sunday 25th February I went to a competition called 1st London Rhythmic Gymnastics Championsip! 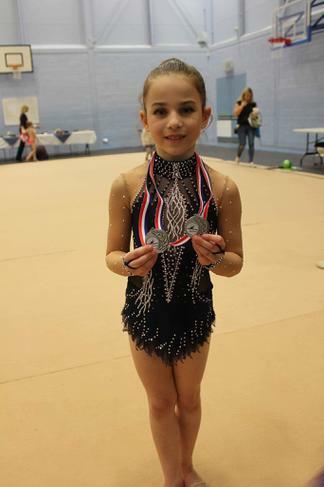 I did two routines, that was free and rope.I came 1st in both routines, I was level 3 U10. I was vs 11 girls. 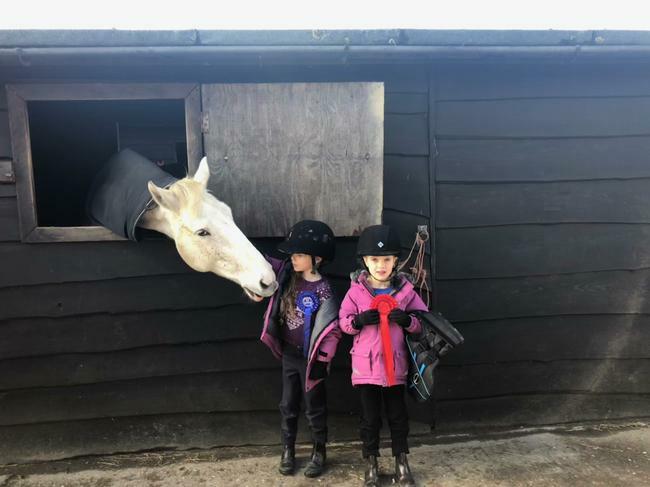 During half-term we went to our amazing Pony Club. That is where we have been going since we were three years old. For the first time, the instructor said we would do a competition, including an obstacle course and a rising trot race. We also had to muck out smelly stables, ride wonderful horses and brush messy ponies. Before we did Half-Scissors we did something called an Around the World. The horses we rode were called Rhana and Hedgehog: Rhana is a little lazy and Hedgehog is extremely bouncy. We were so proud to receive our fantastic rosettes – 1st and 2nd place – when we had finished the tricky race. 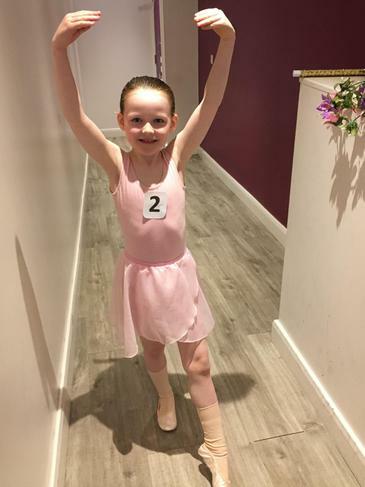 On 24th November 2017 I took my Royal Academy of Dance Primary exam in Ballet. I have just got back my certificate to find out that I got a Merit! I am very happy and my family are extremely proud of me. I am especially excited as the certificate is signed by Darcey Bussell CBE! 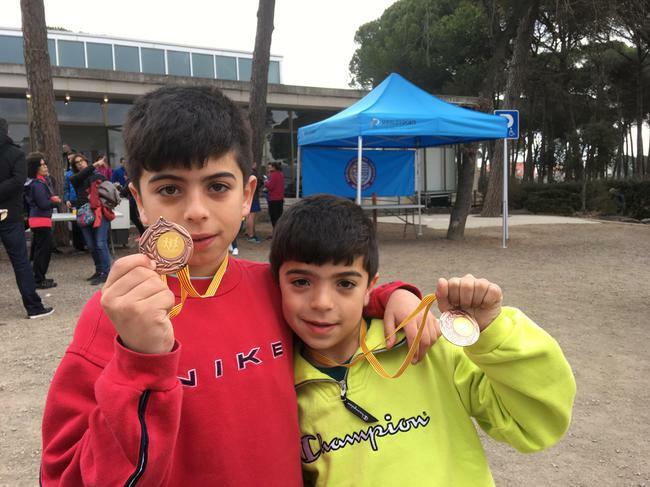 My younger brother and I took part in the "Cursa de Nadal" (Christmas Race) in Lloret de Mar, Spain. The race was around the athletics track. We both came third in our respective age groups. 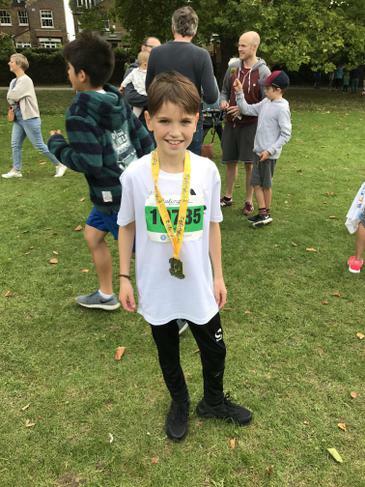 Granddad said that most of the children running the race run every weekend, so my brother and I were very proud of our result. It was fun and we took home 2 medals each and a bag of treats! 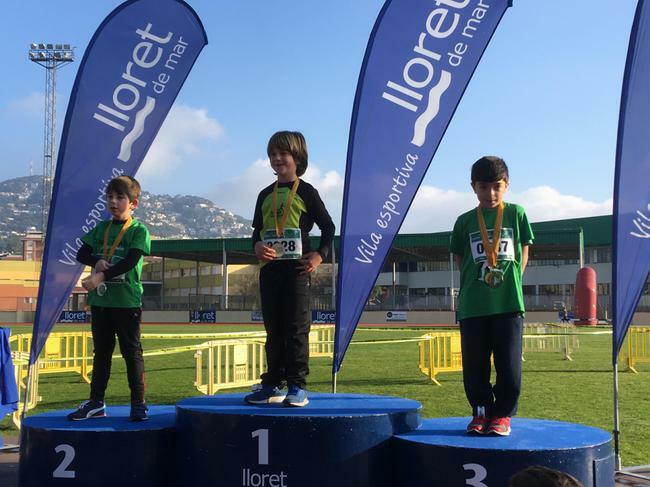 On Boxing Day, my brother and I took part in another race, the “Sant Silvestre Riudellotenca” in Riudellots de la Selva, Spain. 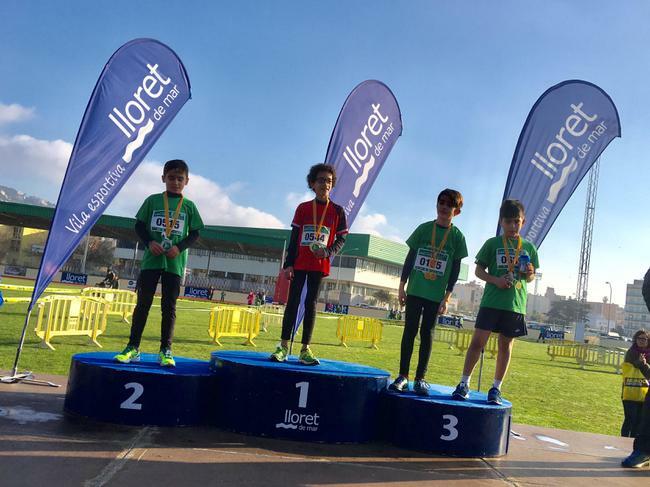 Nour ran 600 meters with the under 8’s group and came in third position. He was very fast at the start and when he was getting tired all the family were cheering him on. He did very well! I ran 1km with the 8 – 12 years old group. It was hard as most of the children were older but I managed to come in within the first 10. I train with Ealing Southall Middlesex Athletics Club twice a week. On Boxing Day (after some persuasion) I went to the annual ESM race. 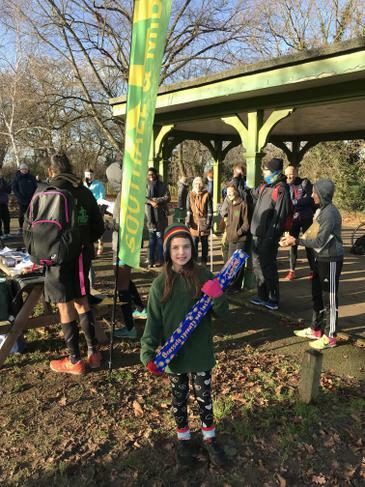 I won the under 11 girls race and was awarded a giant tube of Jaffa cakes! Last summer for my 7th birthday I had a big surprise to go deep sea diving for the first time with an instructor for 3 afternoons down to 6 meters in South of France near the Cap d’Agde. 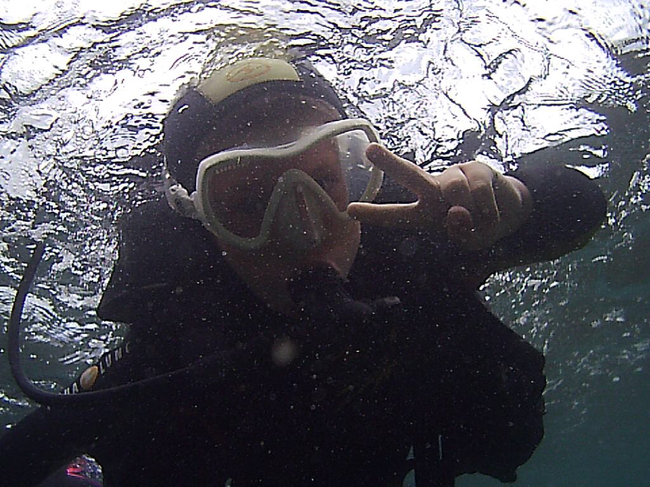 It was amazingly cool and I now can not wait to go diving again next summer. 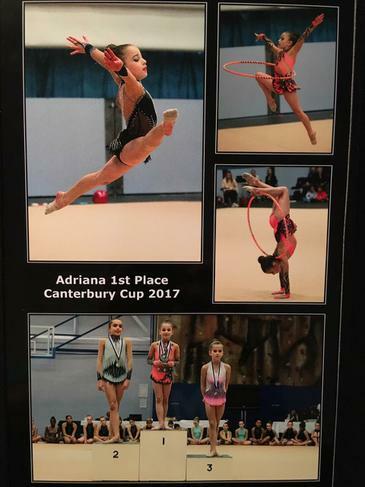 I went to Canterbury for competition of RHYTHMIC GYMNASTICS, which is also known as CANTERBURY CUP 2017!!! I got the 1st place in free routine, the 3rd place in hoop routine and the 1st place overall( you can only get a trophy if your first). I am on level 3 under 10. I was VS 9 girls from my level. I was so proud of myself and my family was really happy for me!!! I was also proud of our club, they all girls got medals in different levels!!! Today, I took part in my second ever karate tournament. I have been doing karate since Year 1 and it is my passion. I have attained a green belt. 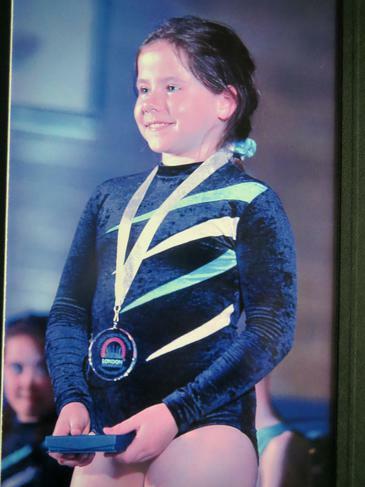 The first competition I competed in, I won two bronze medals so I was hoping to better this. However, the first contest today was the kata contest (a series of moves performed individually) and the competition was hard. I managed to get a competitor's medal for this section. The second part is a kumite (fighting) competition. I fought hard and won two of my matches which got me to the final in my age/grade group. The final was tough and the scores very close but I am proud that I won a silver medal. In June I climbed Mount Snowden. When I got to the top it was 3 degrees so we had to have lunch in my uncles emergency tent. At the start of the climb it was quite flat and easy but as we got further we had to start climbing which was the hardest part. It was really fun and now I want to train to climb Mount Everest! I have been playing pool for the last 3 years at school and have really liked the game. 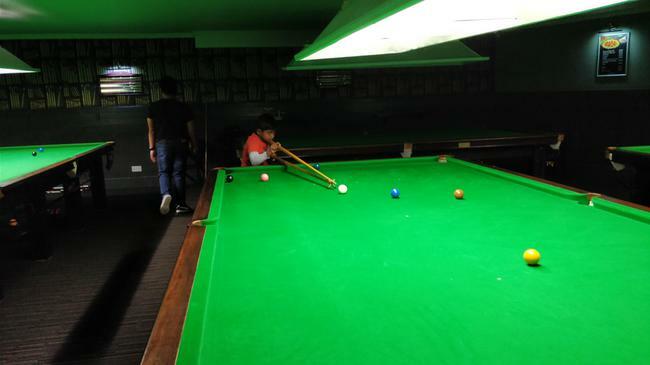 I also regularly watch the Snooker matches and liked the way the top players play, the techniques they use and the fun in the game. 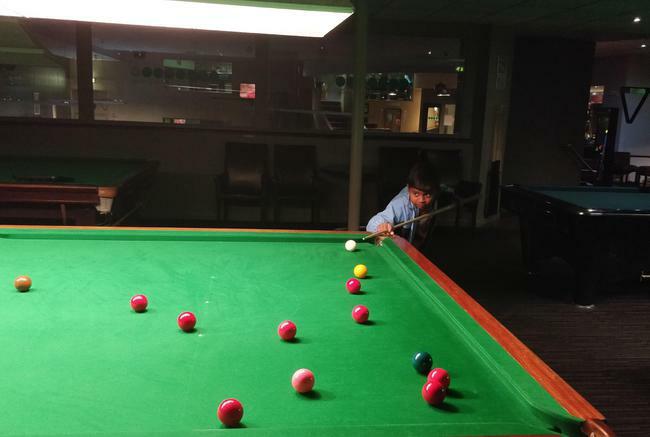 I want to be a snooker player when I grow up and have decided to get some coaching. To play on a full size snooker take, it takes a lot of effort to get the angles correct and to hit the ball with sufficient power. Watching different people play is a great way to learn different techniques and adapt to the situations. 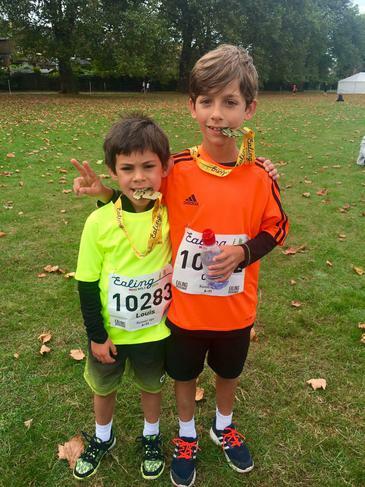 Last Saturday my younger brother and I took part in another Ealing Mini Mile Run. This year we didn't run together as they separated the categories by different age groups. 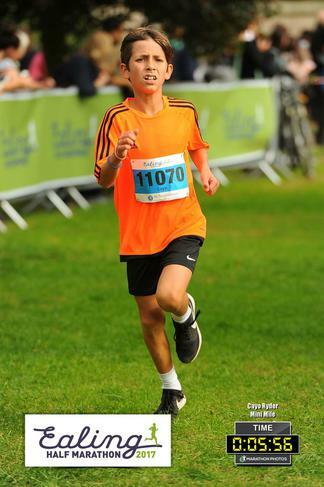 Louis was the first to run in the 6-7 years old category and I ran later on in the 10-11 years old category. 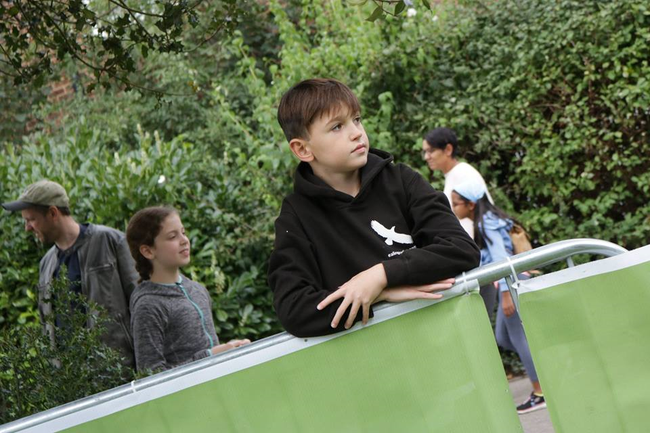 This year we made sure we didn't do the same mistake as last year when we got to Lammas Park within a few minutes of the start of the race and had to start at the back of the group. This year we got there with plenty of time to do some warming up exercises and catch up with some friends beforehand. There were lots of our friends from Fielding participating in the run, as well, which was really cool. Louis had a really good start. He ran super fast! My dad and I ran around the park to cheer him on while mum waited for him near the finishing line. He was looking very tired at one point but carried on, giving everything he could. I was very proud of him. He did almost the same time I did last year, 7.13.8 and came in 4th place in his category out of 246 kids! We were very tired when we finished the race but were also very happy! Especially when I found out that I was quicker than the boy who won the race last year. We can't wait to run again next year! 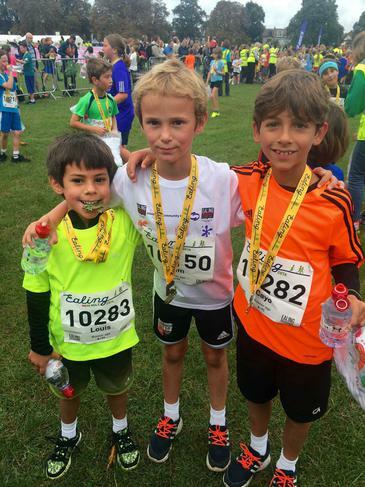 I ran the Ealing Mini Mile on Saturday 23rd September. It was my second Mini Mile. I was really nervous before the race. It was nice to see all my school friends running as well. Last year I ran the race in 6 minutes 50 seconds. This year I ran faster and finished it in 6 minutes and 20 seconds. I was very pleased that I came third out of 194 runners. I managed to beat a boy that I run with every Sunday morning who is a very good runner and always beats me. I like running and look forward to Cross Country every Friday morning at school. Well done to everyone who ran! 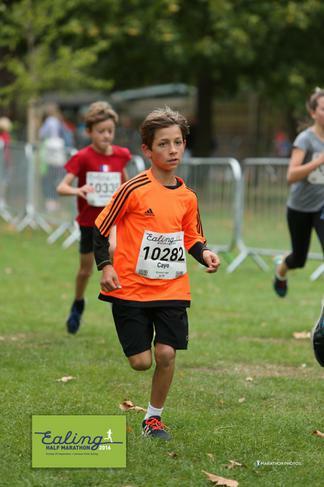 I ran for the first time in the Ealing Mini Mile on Saturday 23rd September. I was nervous as the only races I have run before have been during our school Sports Day! I was really excited as the race began and I started off in a fast jog but then decided to sprint! I didn't know how well I was doing until I was at the half way point and someone shouted I was the first girl! Luckily I was the first girl to cross the line but I then had to wait for all the times to come in to see if I had won and I had! 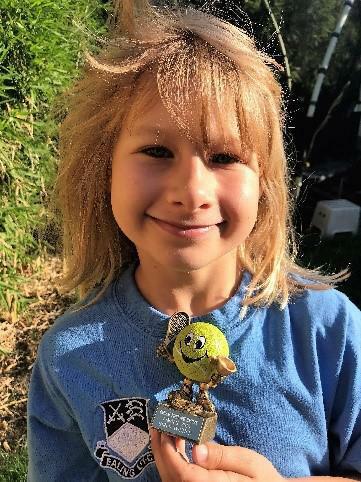 I was so proud to be first out of 93 girls and be awarded a glass trophy but I was also really proud of all my Fielding friends who were also running on the day. I enjoyed it so much I am hoping I will get a chance to run again soon! 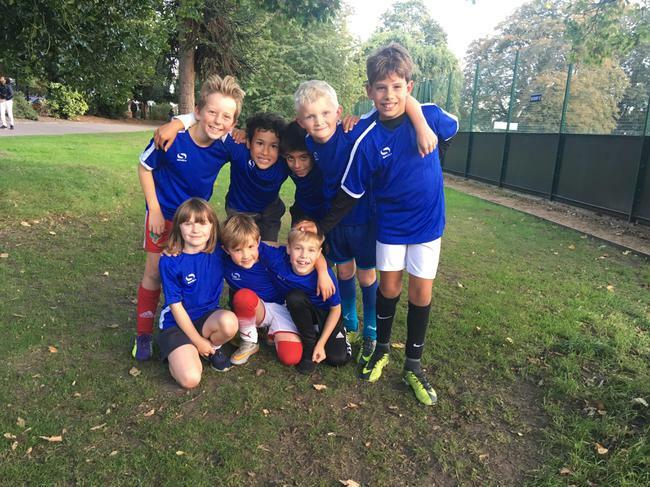 Fielding Wreckers made an impressive start to the Top Bins five-a-side Primary School league in Lammas Park on Friday 22/09/2017 with a huge 13-2 win against St James. The team is comprised of Y4 boys and girls: Joshua 4F, Emil, Henry, Zoe, Charlie, Sofian, Aram and Stan all 4S. 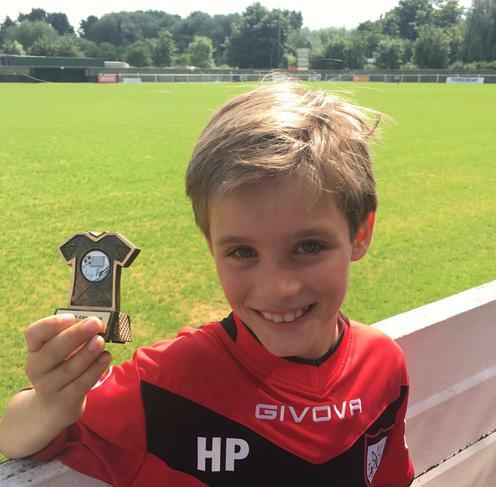 They play under the motto "Have fun and play for the team" and did just that under Henry's captaincy with brilliant passes, some awesome goals and stunning goalkeeping by Stan who was voted Player of the Match by his team. 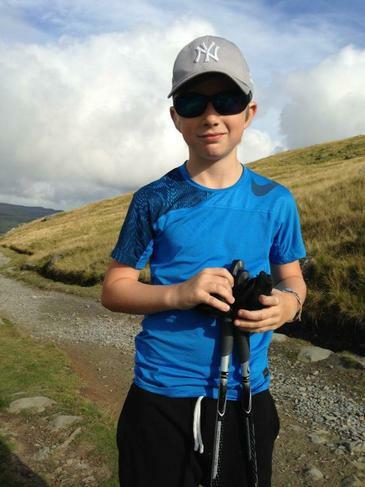 Says Charlie: "I had loads of fun and feel really proud about the team's achievement"
I hiked Mount Snowdon in the summer holidays. It took 5 hours, because we hiked up and down. 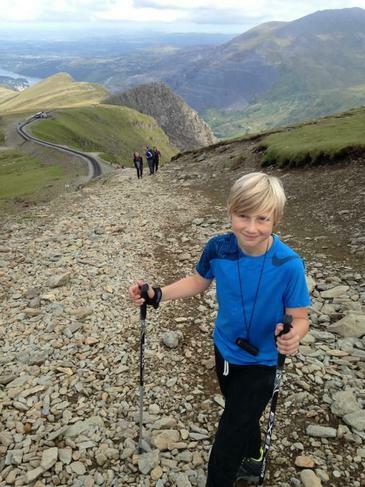 We used hiking poles, which proved helpful over the areas of rough terrain. Reaching the summit felt exciting!! Next year, I am going to hike Ben Nevis. 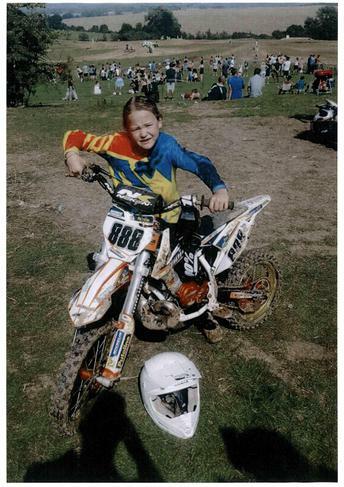 I started doing Motocross racing when i was 3 or 4 years old. 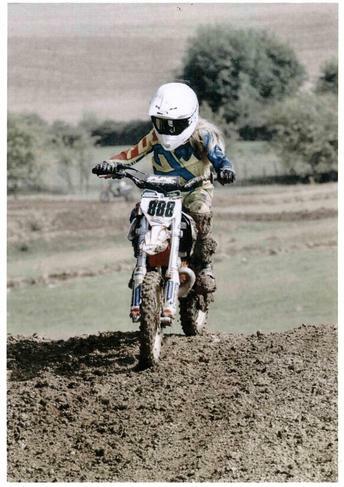 My dad got me into motocross. 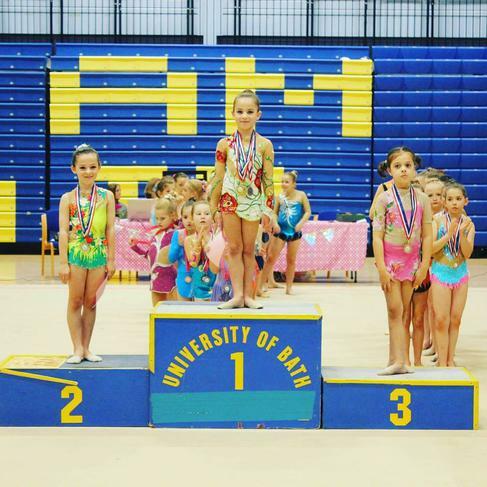 I compete every weekend and have won lots of medals and trophies. I like motocross because it is fun and muddy! I would love to a professional when I am older. On the first week of summer holidays I went to a football camp. I was put in a group with older children and did difficult drills but I still tried my hardest. At the end of the camp there was a presentation. In all three groups one of the players had a trophy and a medal. 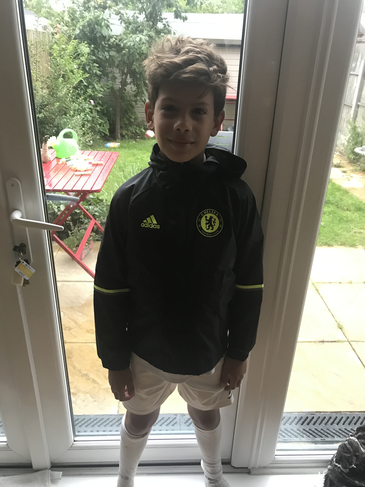 Four lucky children were given a special prize from the Chelsea scout. There were Chelsea Kira and jackets. I was one who won the jacket for my foot work and stamina. 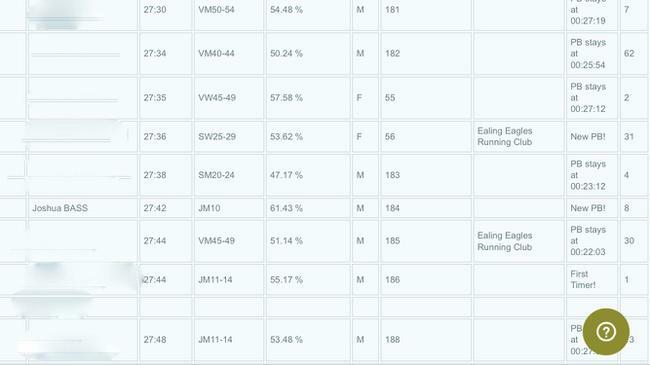 On Saturday 1st July I did the Gunnersbury 5K park run, my time was 27:42 which was a new PB. I came 6th in my age group which was under 10s and 240th out of 441. I beat my previous best time which was 29:37 at Osterley park run. I also got a new Gunnersbury park run PB which used to be 29:52. It was my 8th park run. I only need to do two more to get a 10 park runs t-shirt. My name is Yasmine from 4S. As you can see from the photos I am very passionate about Taikwondo, which I've been doing for past 4 years. 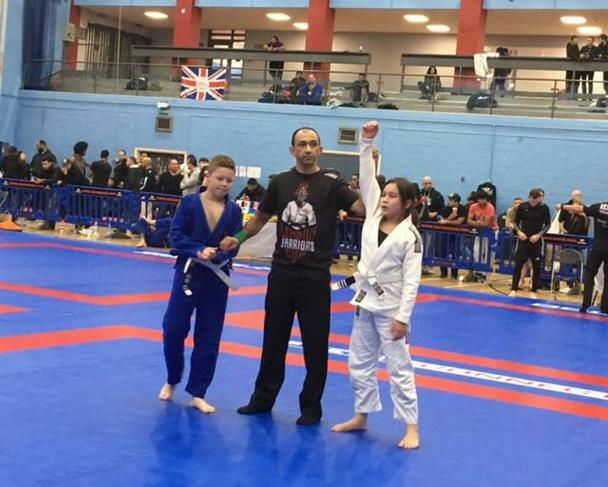 Today I had a competition and won second place for Pattern ( set of moves against imaginary enemy) and Sparing ( free form fighting with enough rules not to make any injuries ). 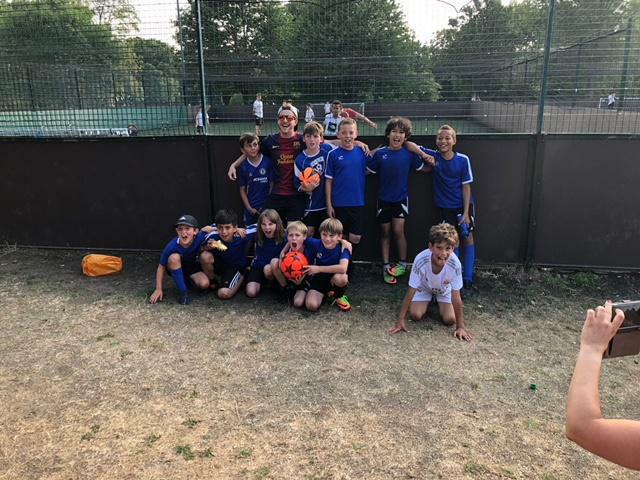 On Sunday 19 June, Alex Brett and Barney Morris (4F), played for Ealing United Under 9 football team. The team have only been playing together for less than a year, and this was their first tournament. The tournament was played at the Sandgate Football club grounds. The Under 9 squad played in the group stages of the tournament, and played well enough to make it into the knock out stages. Alex Brett scored one of the goals to get the team into the quarter finals. The team played very well, and won the final against London Tigers by scoring a goal, the only goal of the match, in the final minutes of the game. Here is a photograph of the team receiving their individual shields and the team trophy. This is a great achievement for a young squad. The squad train at least once a week, and they play in the Middlesex league. 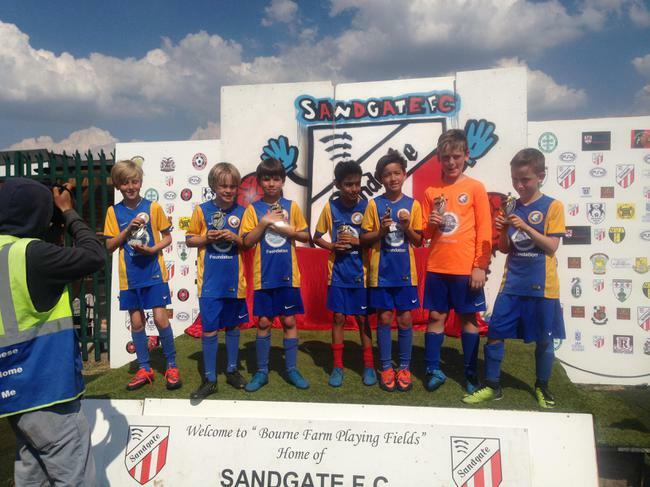 I played in a football tournament last Sunday for Ealing United under 7’s at Sandgate’s home ground. We won our group and reached the semi-final. It is the best my team have done. I scored a goal and did some assists in the tournament. Ealing United had their first awards evening and we had a barbecue. I got a trophy for player of the year– one had a boot on it and the other had a ball on it. I have made new friends playing for Ealing United. Daniel and Finn play for Ealing United as well. My friends help me to score goals by passing to me. The coaches give really encouraging comments and we train on Mondays to help our passing, tackling and shooting develop. 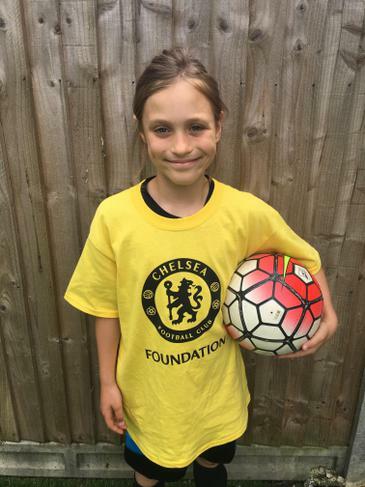 I was lucky enough to be one of 50 girls out of 600 selected to go for a trial for Chelsea Football Club. It was amazing to play at Chelsea's training ground in Cobham and see where the players train! In my U10's match, I scored three goals and set up another three for my match to finish 7-2. It was such a fantastic experience! During the May half term I also attended a FA training course at Hanwell Town FC. 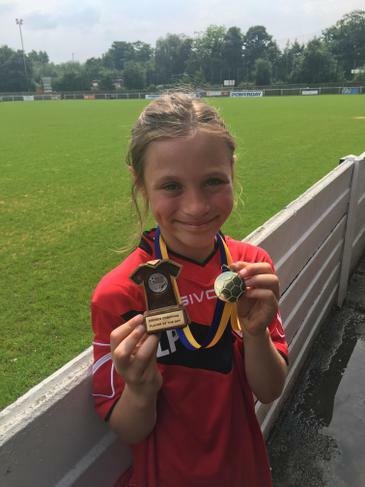 I was the only girl there playing against 28 boys so it was good practise for me and I was awarded Player of the Day for great passing, strong tackles and scoring a good free kick. I am hoping all this practise helps me play well for the Fielding girls football team in the Peal Shield semi-final! During the May half term I attended a FA training course at Hanwell Town FC. 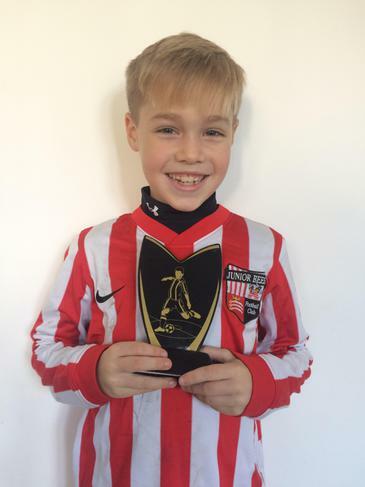 I was lucky enough to be chosen as Player of the Day for working hard on the pitch and for being a good sportsman. I got to play as a midfielder which is my favourite position. This weekend I went to a great competition with around 250 gymnasts, around 30 clubs from 19 countries. I competed in the hoop and free routines competitions.I got second place for free and bronze for hoop and a trophy that is third. I play tennis at least 3 times a week. I have lessons at the club West Middlesex Lawn Tennis Club. On Mondays and Wednesdays I have an academy lesson which is when kids have a lesson together. On Tuesdays I have a lesson by myself with my tennis coach. 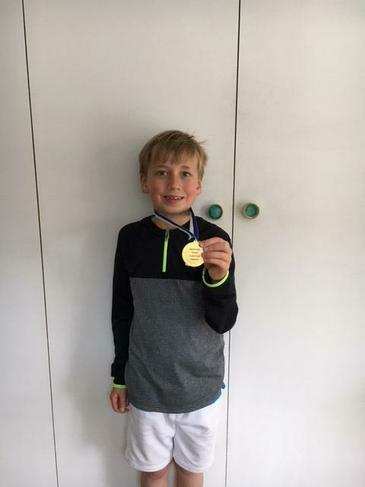 Sometimes I have a tournament like I did today and I could win a medal or a trophy and sometimes I go to the tennis club to play tennis with my brother, George in 5S. I enjoy myself so much playing tennis. On the 30/04/2017 I played a tennis tournament at Will To Win Lammas park. I came first in the tournament. I played 6 tough matches and won them all. If you can’t read what it says on the medal because it’s blurry, it says MIDDLESEX TENNIS CLUB TOUR WINNER. The final was my toughest match but I won. The score was 10-8. 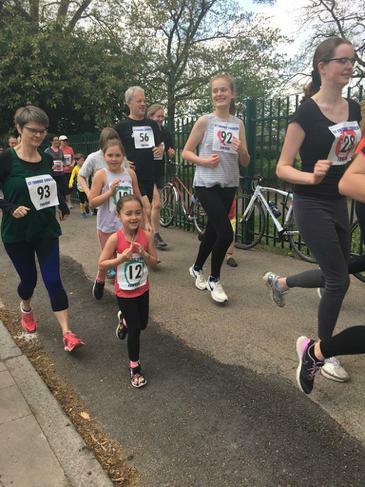 Last weekend me and my sister Savannah ran in a 2.5 km charity fun run in Elthorne Park. When we were running I did not stop the whole time which helped me finish in 18 minutes (beating my personal best by 2 minutes!). I am proud that I finished the race and I did it for charity. Everyone was there to cheer us on and it was a lot of fun. I am glad we did it. Savannah also did great and finished her first ever run in 17 minutes. We both got medals and a banana each at the end. I look forward to more runs in the future. On Sunday 2 April 2017, I went for the first time to Grades in Canterbury Rhythmic Gymnastics Zone A , Levels 1-3 Competition. I did 2 routines and I got 2nd place for both of them! I also got a certificate for an original and challenging routine. 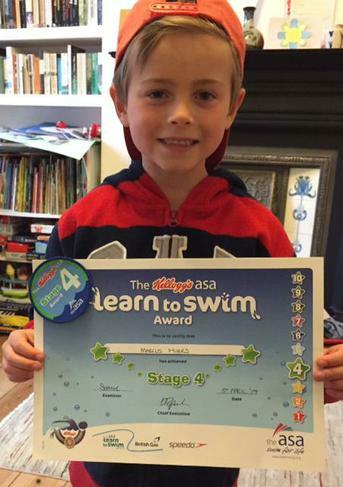 In the first week of the Easter holidays, I moved up from Stage 4 to Stage 5 in my swimming lessons. I moved up because I did a whole length of back stroke and a whole length of front crawl. I got a certificate for achieving Stage 4. I’m now one of the youngest in Stage 5 but I am doing really well. 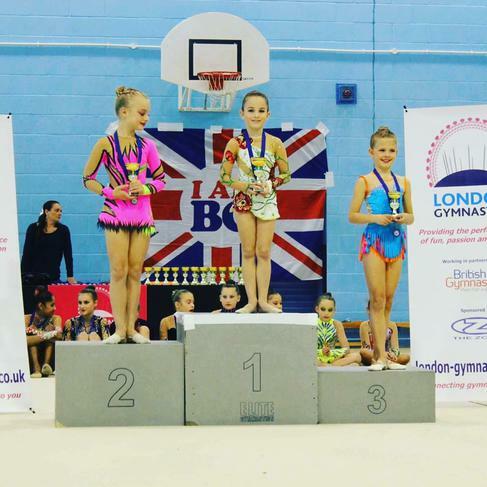 In the Easter holidays I competed in the London Regional Trampoline Championships. 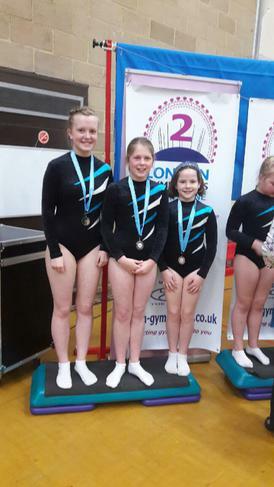 I was in the Under 15 category in a team with Alys and Elinor Greenshields, who went to Fielding. Our team won silver. It's the first time I've been in the under 15s - everyone is much taller than the Under 11s! 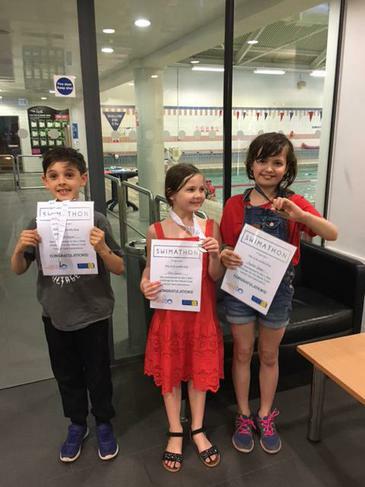 During the Easter holidays Charlie, Molly and I took part in a Swimathon, organised by our swimming school, to raise money for Marie Curie Cancer Care. Between the two teams (3 children per team) we raised over £800 and swam an amazing 1.5km in total. I swam 34 lengths, Charlie swam 26 lengths and Molly swam 16 lengths. We all felt really proud of our achievements and very happy that we helped raise money for such a good cause. 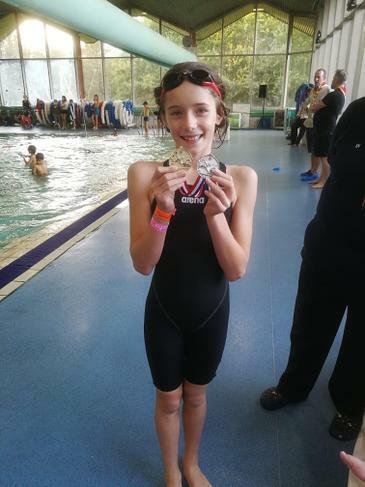 We hope to swim even further in the Swimathon next year! 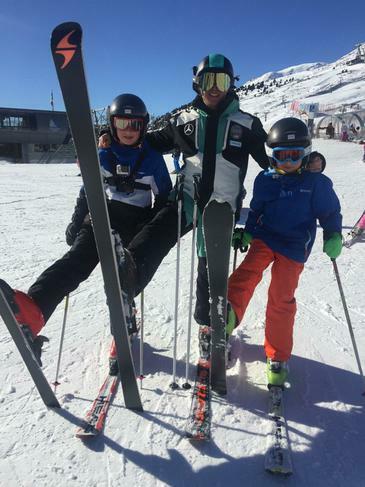 Over half term I went on a skiing holiday with some of my friends and my family. I spent every morning from 9am-11am in the Italian Ski School. There were eight of us in the group. Ski school is really fun. I loved going on all the steep runs (especially the black runs). I was really happy to have won – even if they spelt my name wrong. Later that day there was a presentation for all the ski school groups. When it was our group’s turn I was presented with a trophy cup. 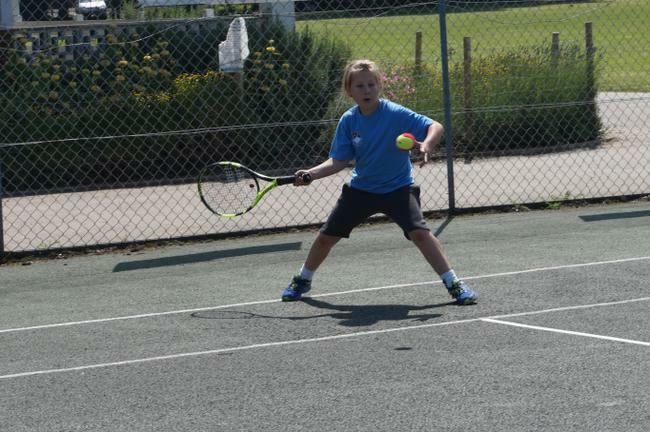 My favourite sport is tennis, and I practice at West Middlesex Tennis Club, playing in their Academy twice a week. 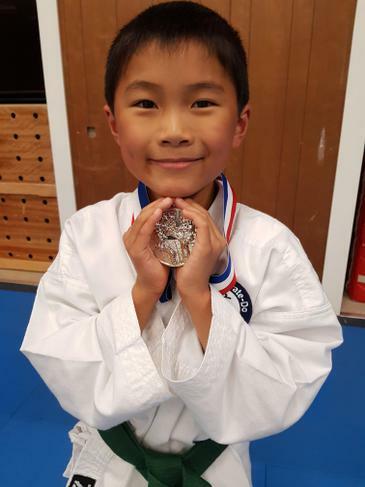 In December I took part in the end of year U9's tournament and won the gold medal. I won 6 matches in total with my toughest match being against Jake Toynton in Year 3. Winning the gold medal was great, but more important to me was the Cadbury's selection box that was also part of the prize!! We played Ealing Stars away and I scored a hat trick. Coach gave me Man of the Match for "a great hat trick". We played five-a-side and on my team was Tristan (3F) who set me up for all my goals. We won 5-2. 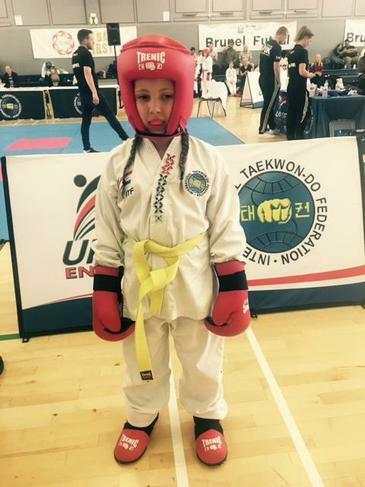 I have been doing Tae Kwon Do since I was 5 years old (3 years). On Sunday, I did a Tae Kwon Do grading. I already had a yellow belt with a green tag and after my grading I now have my green belt. I got an L grade out of A (advance), O (ordinary) and L (low). To pass my grading I had to learn patterns called Dan Gun and Do San. 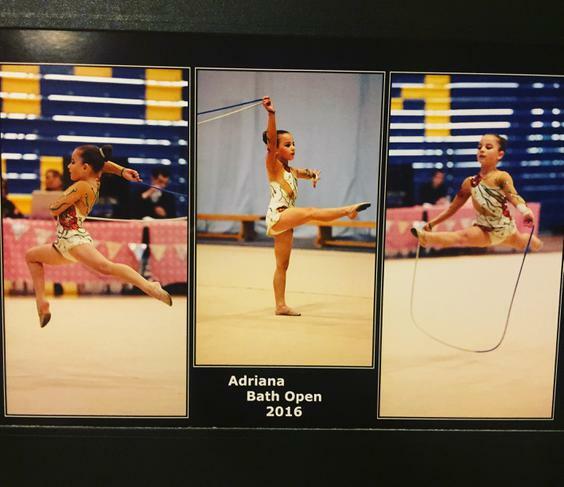 Then on Sunday 30th October, I went to Bath Open Rhythmic Gymnastics Championships 2016 where I did a rope and free routine. For my free I got a bronze and for my rope I got a gold. 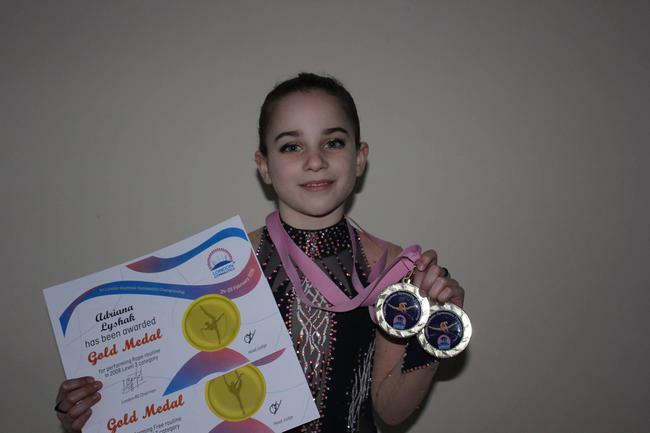 I also got for a total two routine Gold medal. 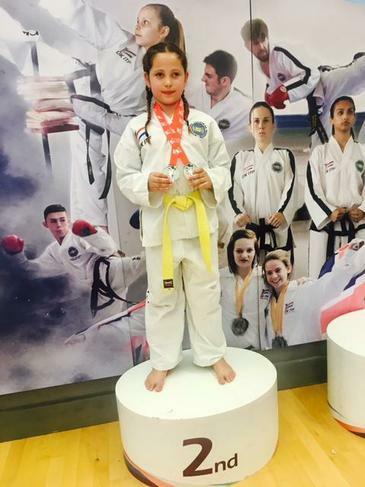 On Sunday 6th November I competed in a Karate tournament and won gold in the Team Kumite (fighting) and silver in Junior Kata- 3rd Kyu. 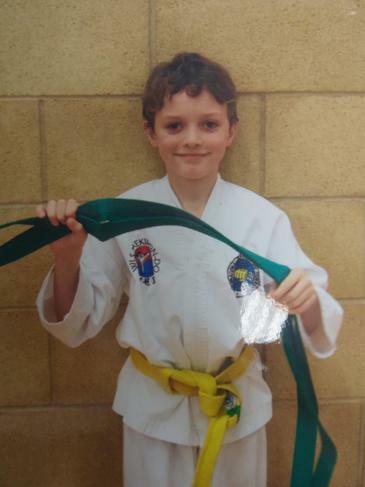 I have been doing karate since year 1 and now I am a brown and white stripe belt. 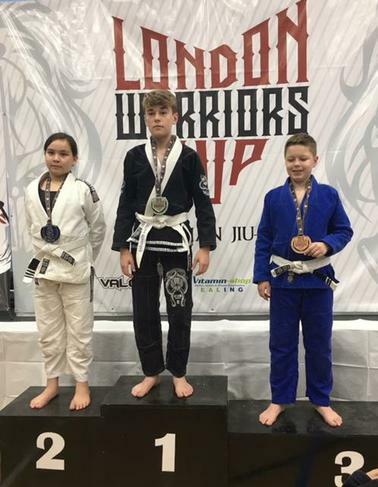 On Sunday I competed in the London Warriors Cup, Jiu Jitsu and came second. I had to compete against two boys in the division above, they were older and heavier. 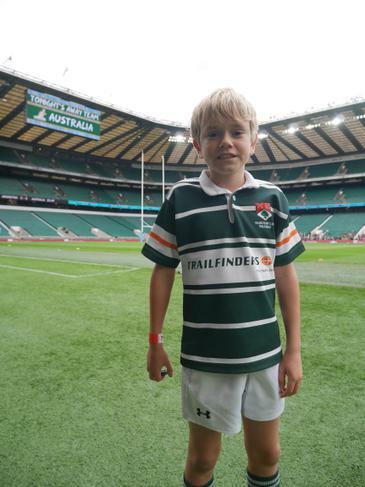 On Saturday 8th October 2016 I played in a rugby tournament for my team, Ealing Trailfinders, at Twickenham Stadium. After the tournament I watched the Argentina v Australia international match at the stadium. When I walked on to the pitch for the first time it didn’t feel any different to any other rugby pitch except the turf was a lot nicer. My team won a game and lost a game which I’m pretty happy with because the teams were quite good. The match afterwards was really interesting to watch because it helped with our tactics and I enjoyed it. My grandad likes rugby so we got him tickets to come along. He was very jealous that I got to play at Twickenham. 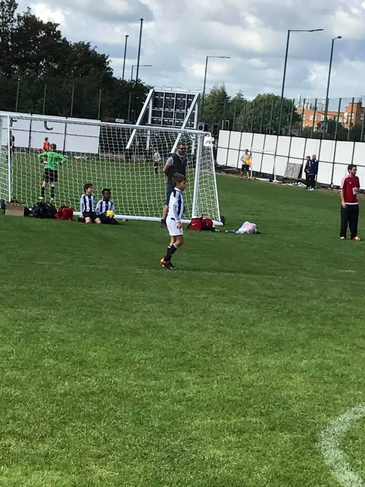 Sunday the 2nd October 2016, I played my first match with Hanwell FC football team , and I nearly scored a great goal. My first position was as a defender, then I played as a mid fielder and finally as an attacker. We won the match 8-4. Despite being a hard match I greatly enjoyed it. Whilst playing the match I felt also very excited and proud. Hopefully next time I will score more goals. 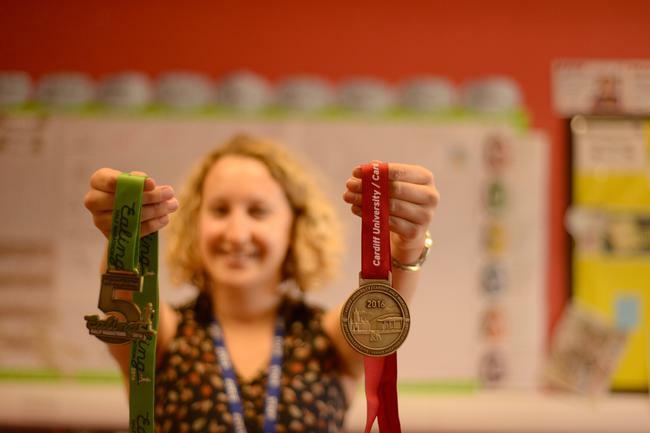 Congratulations to Miss Drage who ran two half marathons two weeks in a row! 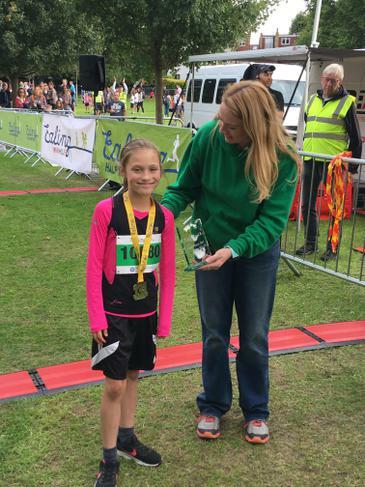 She ran the Ealing Marathon with an extremely respectable time of 2h3mins and the Cardiff Marathon in 2h7mins. Well done Miss Drage! Last year I had a very good cricket season. I played a lot of matches for Ealing Cricket Club. We won 7 matches and lost 2. My friends Toby, Jasper and Thomas were also there but I made a lot of new friends too. We played against teams from north and west London. It was funny when a deer walked across the pitch against Teddington and we had to stop play. It was very fun because we got to bat and bowl every single game. We bowled 2 overs in each game and bat for 4 overs in a pair. I was the top scorer with exactly 100 runs in the 8 games I played. We also played two hard ball matches just with our team. 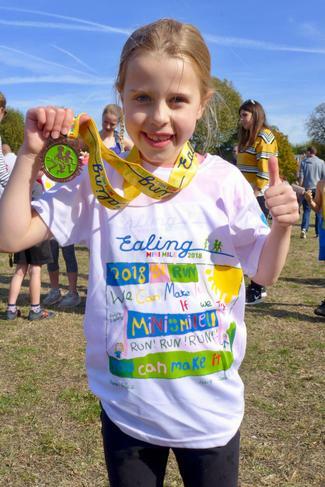 Last Sunday I took part in the Ealing Mini Mile Run. 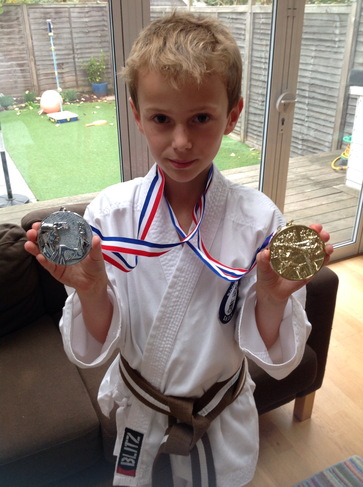 It was my second year and my younger brother’s first time (Louis Ryder – 2S). Even though, we started at the back, we came 8th and 36th , respectively, out of 114kids in our category (6-9 years). Next year, we will make sure we arrive there earlier to start at the front. My ambition is to win my category. 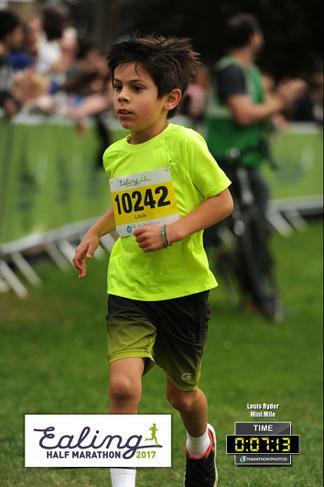 This summer on Sunday the 25th of September I took part in the Ealing Mini Mile event at the half marathon. I have taken part 4 times but this time it was my best by a long way. I finished in 7 minutes and 12 seconds the same as my friend Marta and just ahead of my friend Lily. 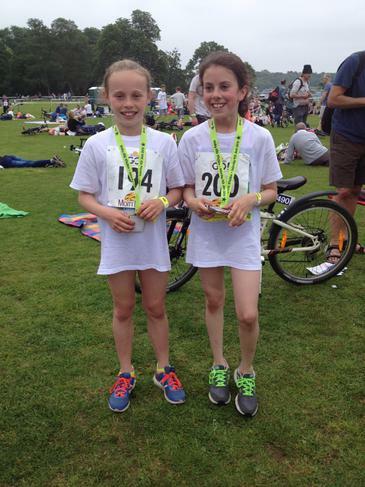 In the 6-11 girls category we finished 5th, 6th and 7th. It has really helped doing all of the miles in PE and cross country club and we all really enjoyed it! Also it was really good to see so many Fielding students there. 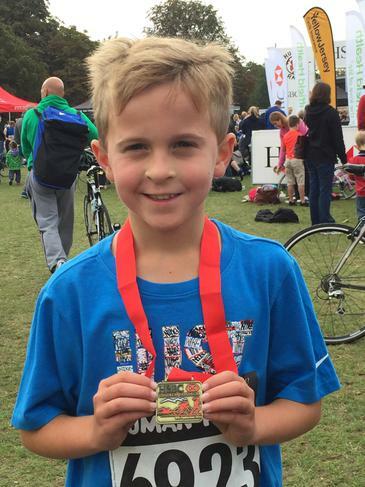 Also in the summer I took part in a triathlon with Mart, my brother Noah and his best friend Thomas. We did a 50 metres swim and a 2k bike ride and a 1k run. I think we were quick but we could do a lot better next year. I really enjoyed the swim because the pool was really nice, but it was very cold. I liked it because we could do three of my favourite sports in one race. 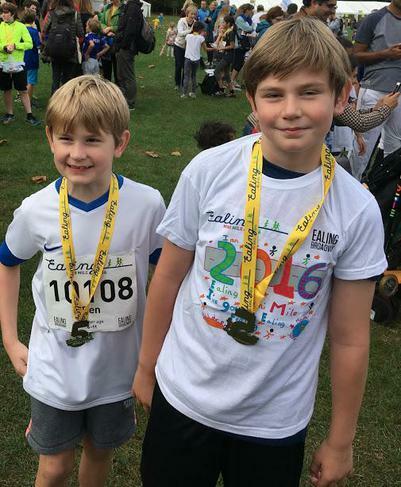 My brother and I ran the Ealing mini marathon on Sunday. It was my third time running marathon and Ben's first. It's a great feeling when you cross the finish line and we are really proud to have raised over £520 for leukaemia research. I have been doing ballet since I was three years old and I have just passed my grade 4 ballet exam with a merit. I am currently preparing for my grade 5 exam. I plan to audition for London Children's Ballet so I can perform at the theatre. I also play basketball and I been invited to join the Phoenician Phoenix team. Three times a week I practice Brazilian Jiu Jitsu and recently I have been training with world champion BJJ fighter to help prepare me for my first BJJ competition at the end of October. 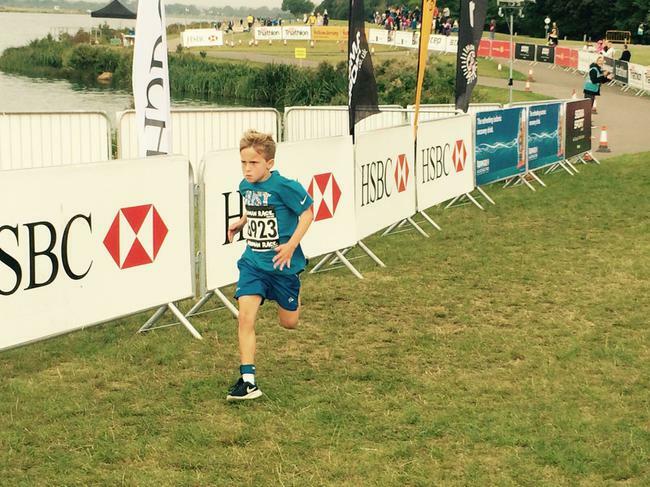 Sunday was the Human Race triathlon events at Dorney Lake. My dad and brother competed (& did very well) and so did I. I was too young for the triathlon but was able to enter the 2k run for 9-12 year olds. I ran it in 10 mins 40 seconds and came third overall. 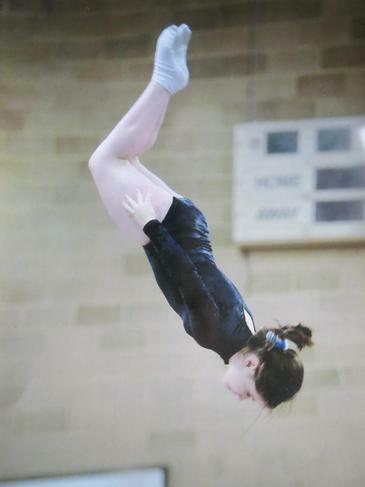 I love trampolining, I go twice a week to the Zero Gravity club at Elthorne Sports Centre. My coach is brilliant and I’ve made lots of friends there. I love the moment at the top of a jump when you feel like you’re flying. There are so many moves to try out, there’s always something new to learn. 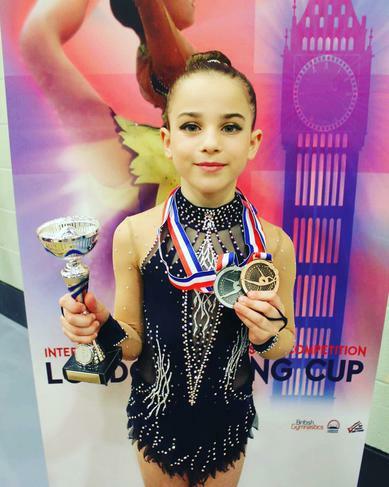 Competitions are fun too – this summer I entered the 2016 London Championships and won Silver in the Under 11 Elementary category. It’s a wonderful feeling to get a medal – it’s also a medal for the people who helped me get this far. 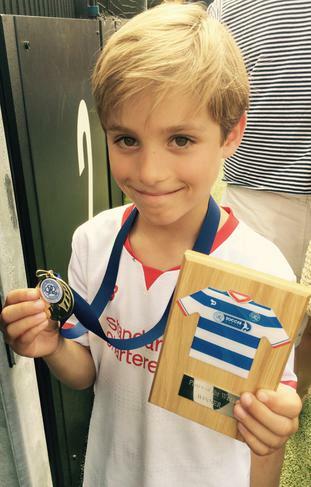 During the summer holidays I attended a week long football training course with QPR. 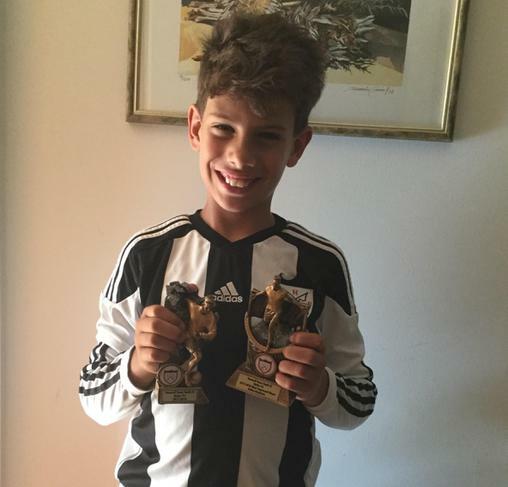 At the end of the course, I was chosen as Player of the Week for having a great attitude, good football skills and scoring lots of goals in all my matches! 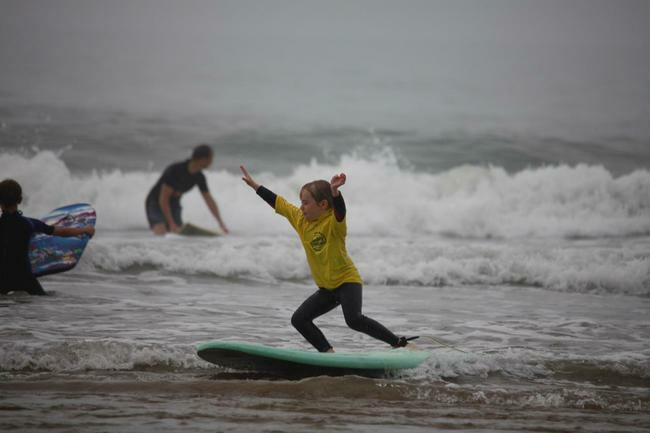 This summer I learnt how to surf in Devon. 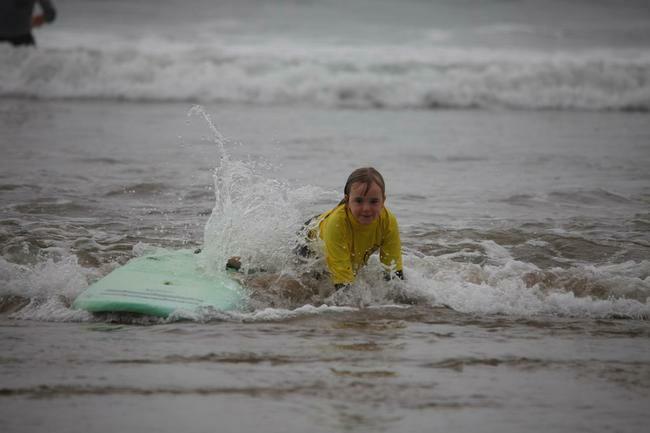 Surfing is now my favourite sport. 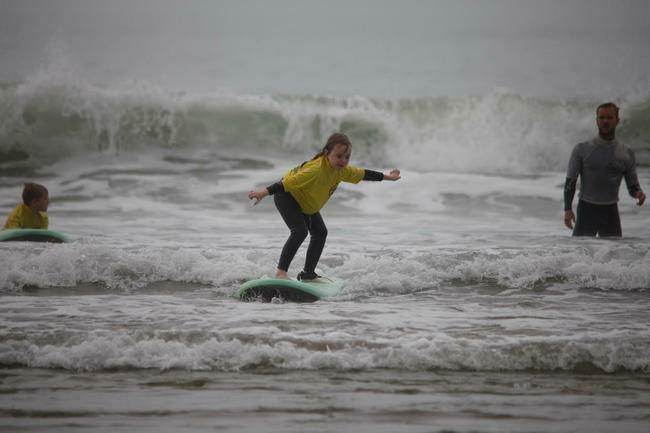 I had two surfing lessons and can now stand up on my surfboard.